The new Military & Police pistol is actually a hybrid. "Stuff and feathers!" I muttered to myself. "Jerry told me to cover Smith and Wesson's 'innovative new pistol,' the M&P, and all it is is combat Tupperware." Think of it as a steel pistol with really big grips. Designed for government use from the mag well up, S&W's new hybrid has all the features associated with current law enforcement handguns, plus a few other refinements. 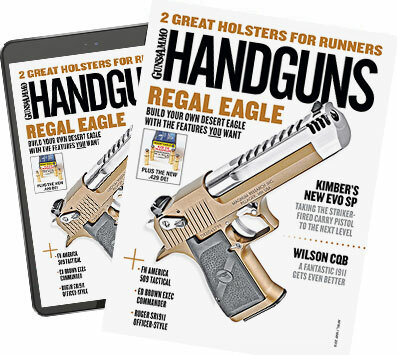 If you're a dyed-in-the-wool 1911-ista like myself, you can skip this articleâ€¦that is, unless you have a curiosity about firearms development and would like to see where the next generation is going. My boss, Handguns editor Jerry Lee, dispatched me to Primedia's semiannual roundtable so I could get up close and personal with the new pistol and the corporate team that gave birth to it. Smith & Wesson's Joe Bergeron first revealed this new hybrid to an assemblage of writers at Pike County's lush PASA Park shooting complex, near Barry, Illinois. As handguns product manager, Bergeron headed up the design program. "How did you come up with the parameters for the design?" I asked. "We put everybody into one room and threw 'stuff' against the wall for 12 hours," he said matter-of-factly. "Sean O'Clair did the ergonomics, which was really important to us, and Brett Curry led the engineering team on the chassis design." Cutting to the chase, the big deal about S&W's M&P pistol is that it is just another plastic pistol in the same way in which the gull-winged Mercedes is just another commuter car. There is a stainless chassis embedded, or rather cast, into the polymer portion of the frame. Think of it as a steel pistol with really big grips. The fully tempered stainless slide rides on four ovoid metal tabs at the corners, and unlocking occurs on the same chunk of metal. Viewed from the side, the chassis middle is in frame defilade, with the ends--the tabs--sticking up like a curved hot dog sticking out of a straight bun (but without the ketchup and mayo). The slide has a finish hardened to a Rockwell of 68. The advantage here over all-metal guns is the lightness and grip comfort of a polymer gun combined with the durability and precision of an all-metal design. The reason for the tabs being ovoid is so that as wear occurs, the points of contact remain centered and don't wander up and down what appears to be a straight surface. This feature assists in maintaining zero throughout the life of the weapon. In the prototype tested, these tabs and other hard-working parts were severely discolored from S&W's endurance testing. The pistol had been through more than 6,000 rounds without lubricant, including rapid-fire, high-heat tests. It had been cleaned, but to check wear patterns, it was left as dry as that August was in Sarcobatus Flats. As the LE target market is fraught with legal issues, Bergeron's team decided to go with a double-action-only striker but is entertaining options. This is one of those set-ups, so common now, where about 70 percent of the cocking is accomplished by the slide, leaving only 30 percent for the finger. If you get a click, chamber a fresh round and get back to work. "Cooper-ites" will shake their heads and wander off muttering, but this is what has resulted from trying to please the shooter while taking a heads-up from decades of litigation. In this sense, the M&P takes a lead from Glock with a passive trigger safety and does not require a decocker or manual or grip safety. No pullem trigger, no go bang. An action lock is located on the left rear of the slide. The pistol is designed for holster use from the ground up, the front of the slide being tapered for reholstering and the weapon being free of bumpy controls. The ambidextrous slide release is there, but after seating a fresh mag, it's easier to give the wavy slide cuts a slight tug and let it fly forward. The toe of the mag well and mag base forms a gentle hook for ease of draw, and there is a mild stippling of the frontstrap area and palm swell. out the range officer's patience, especially when goofing on Brad Pitt's Kalifornia technique. The conventionally located mag release is unique in that its straight spring also retains the piece. Hooking into a curved notch, it is easily accessible when the slide is removed. Just move it over with a pencil or finger, and unhook it--the release then falls out and is tossed into the other side, and the spring is rehooked. With practice, it takes about 30 seconds. As with just about everyone else in the industry, S&W chose to go with the ubiquitous Novak LoMount three-dot sights. I've grown to like them, and with the exception of a Heinie, I can think of no other that I'd rather have. The only parts of the gun made outside the U.S. are the magazines, of which the tubes are formed in Italy. Although stamped with the S&W logo, the 15-rounders look suspiciously like Beretta mags. Again, thinking of gender-mixed LE and military applications, S&W incorporated three different palm swells, which can be changed faster than Hollywood marriages. During my examination, Bergeron asked me not to show the inner design of the swell--not because it's secret but because the grips will be supported differently on the production models. And, yes, there is a 1913 rail on the chin for the full range of applications. Perhaps, on that big design day two and a half years ago, there were too many Euro pistols on the sampling table, or maybe Curry had stayed up all night watching old James Bond movies. Maybe there were designers from Walther in the room, but for some reason they tossed in a magazine safety. Yes, a mag safety. It's so much a part of the design that rotating it out of the well is part of the disassembly procedure. But let's not dwell on this glitch; besides, it's optional for LE/military. In the hand, the M&P is mighty comfy. It's not nose-heavy like a 1911 or a Glock, nor does it sit back on the hand like a Luger or P38. It has a sort of neutral balance. I really liked the kicked-forward toe and the rich feel of the grip on the web of my hand. It came naturally to the eye like an XD, and the trigger, though deeply curved, didn't bite the finger on double action. Alas, for those of you hoping for a classic S&W trigger, especially after S&W's triumph with the S&W 1911, this was a bit, well, polymer-esque--a tad spongy, if you will. The trigger interacts through the chassis, so it should be as crisp as an overcooked Pop Tart. One must remember, however, that this was a prototype. By the time it gets into production, it may be refined. On the range at PASA Park, I had to compete with a flurry of writers and the "Guns & Ammo TV" crew to get my hands on the weapon's black Melonite grips. Everyone wanted a piece of the excitement, and after sweating in the tumult (August in Illinois), I gave up and waited until after an air-conditioned lunch. Winchester white box and Silver Bear both performed flawlessly in the M&P's hybrid action. The prototype I fired ran like the Energizer bunny. For yucks I ran some loose Federal through it, then that weird zinc-coated Silver Bear and finally, the Winchester white box that was the ammo du jour at the roundtable. Lubeless, the M&P munched the varied .40 S&W fodder as contentedly as Bossy the Cow grinding silage. The Silver Bear's zinc-washed cases were the subject of much comment among the writers and reps. "It feels like they're coated with lapping compound," said one. To which the guy from STI said, "Hey, you can shoot and polish your chamber!" Humor aside, the Silver Bear cases are completely safe, and every one went bang and to the intended point of impact--not bad stuff at all. Heckling the gun is always my favorite part. I shot several mags through the piece, which dropped the plates with alacrity, and then I started my jam-provocation protocol, much to the disgust of Lee Atkins, the range officer. I shot it upside down, sideways right and left, then limp-wristed it in the extreme. Placing my left thumb behind the grip, left finger on the trigger, and pinching the front of the triggerguard with the thumb and index finger of my right hand, I squeezed off a magazine. Then I did it again with two thumbs on the strap and two fingers on the trigger. It kept on running, as if the pistol were saying to me, "So, what else do you have?" Finally, it was time to do the sideways overhead, pioneered by actor Jason Patric in the 1991 cult classic Rush and made famous by Brad Pitt in 1993's Kalifornia (several police officers have commented that this ridiculous technique, widely adopted by ignorant gang members, has saved hundreds of lives, and they offer their thanks to these two movies). Even partially inverted, with a weak grip and firing down at a 20-degree angle, the M&P continued to perform flawlessly--even as Atkins boomed out, "And just what are you trying to prove?" Range officers are born with no sense of humor. But I digress. These techniques have turned other guns into non-functional objets d'art and didn't phase the M&P, so my hat is off to Bergeron and Curry. Too, the M&P feels good in the palm and, oddly, didn't have the hand-smack normally associated with .40 S&W--so O'Clair gets a nod, too. Finally, the time came to test the author: accuracy. The PASA support staff put up a standard cardboard silhouette with a six-inch Birchwood Casey stuck on it. I backed off to 10 yards and tossed out a careful five rounds, off-hand. The group was good, except for my flier, and although it seemed fine to me, I could see on Bergeron's face that he wished a better shot (there were a lot around, including sheriff Jim Wilson) had done the testing. On a note of confidence, several of us were discussing a torture test for firearms, and Bergeron unhesitatingly volunteered his baby for whatever we had in mind. Considering some of the twisted minds where I work, that took some real confidence. Will I trade in my Argie 1911 for an M&P? Naw, I'm too used to old iron. But if I were purchasing for a department or an agency, I'd make darned sure that an M&P was brought in for competition.